Many professionals feel that their jobs are taking over their entire day and leaving them with no free time to do other things. Personal trainers are no exception. Many times, personal trainers think that they do not have enough time hours to coach clients, manage their business and maintain their lifestyle. If that's how you feel right now, here are some tips you can use not only to manage your time at work efficiently, but also to coach more clients effectively, so you can make more money in the process while still getting some time off. Most coaches do not want to be slaves to their clients' schedule by working 100 hours a week. To avoid this, you need a system in place that allows you to take on more clients while still delivering amazing results. A plug and play program is a streamlined, flexible template that you can use to create individualized programs for hundreds of clients without compromising the quality of your work or results. This technique involves automating recurring workouts which are of low value, saving you lots of time. You can create and keep your template on Excel. For instance, instead of having to write a new workout for every new mom or business executive who walks into the gym, you could create a program with workouts suitable for such clients with similar needs. You can then spend your time on higher-value tasks or personal errands and still deliver a great coaching experience. 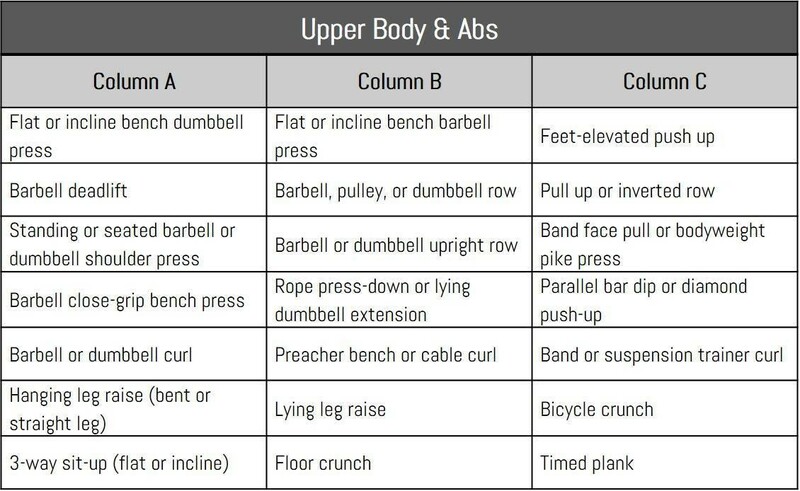 Going row by row, you can simply choose an exercise from column A, B or C. This will give you 343 different workout routines all from this simple template. Once you have a template like this set up,. you simply mix and match to create the workouts you need. 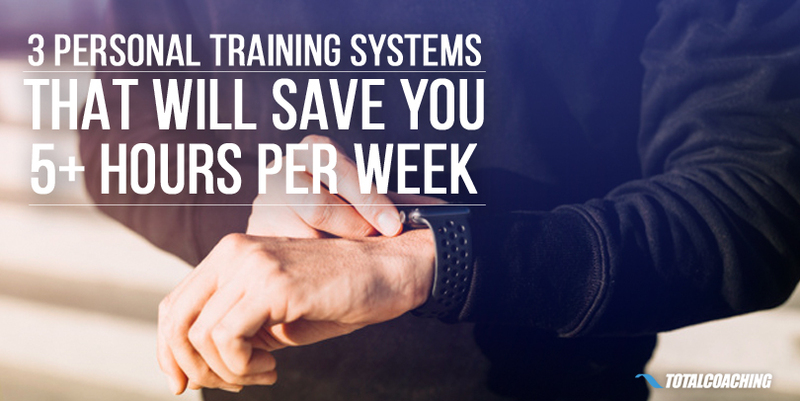 This can easily save you several hours each week without sacrificing the quality of workouts you provide to your clients. Don't forget, however, that the plug and play method requires you to revise your automated programming to suit clients with different goals (e.g. those with injuries) when appropriate. As your business grows, you may have noticed that it becomes impossible to record every crucial detail for each of your clients. You might lose track of who is on what program, what each client's goals and challenges are, what they've been eating, what their most recent fitness stats were, etc. Therefore, you need a system to help manage all this. Calendars, diaries, spreadsheets, email or even texts are useful but are not efficient. Using technology such as mobile applications that can handle your appointments and automatically send texts or email reminders to your clients will save you time. Personal training software, like Total Coaching, can manage your time and communication, allowing you to focus on coaching. Aside from simply keeping you organized, personal training software is a huge value-add for your clients because it lets them input the exercise they do on their own, which can boost accountability in a big way. Most trainers spend so many hours of their lives in a gym. However, in this information age, this doesn't have to be the case, especially when you consider what many personal training clients really need (i.e. accountability to do what they know they "should" be doing!). When planned and executed correctly, online coaching allows you to reach more people in a more automated way. With online coaching, you can help clients outside your immediate geographic area, working more efficiently, saving time, making more money, all while enjoying a more flexible lifestyle. As we talked about in the previous section of this article, you don't have to dive in all the way. You can start by building a hybrid fitness business, where you do some training in-person and some coaching online. Then scale it! Build a website, get active on social media, perhaps even explore running some Facebook ads to expand your audience. Determine your area of expertise. Identify what makes you different from others and be able to clearly communicate that uniqueness to others. Find 2-3 places that your ideal target clients spend time online (e.g. in a particular Facebook group, on Instagram, etc.) and be active in that community. Develop a sales script so that you can effectively pitch leads as you connect with them. At the end of the day, to save time, you need to be able to manage it. No matter which training systems you decide to adopt, time management is the underlying principle that will help you become more efficient in your profession so that you can juggle between clients, business tasks and your personal time away from work. What is the one time-saving tactic you're going to implement first? Tell us in the comments section below. Andy Groove is a professional trainer and a health blogger. He’s a great fan of the gym and a healthy diet. He follows the trends in fitness, gym, and healthy life and loves to share his knowledge. 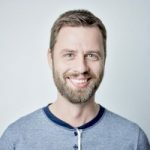 Andy is a content creator and feature writer in Steroid Sales Guide.